Emeralds are one of the 4 "precious stones", a valued gemstone most often having a clear dark green color. The emerald is a variety of the mineral beryl which derives its color from chromium and vanadium. It has a hardness rating of 7.5, and Specific Gravity of: 2.65 to 2.76. These gems are often used in jewelry. Emeralds have long been mined in Egypt, and are also found in Pakistan and Colombia. 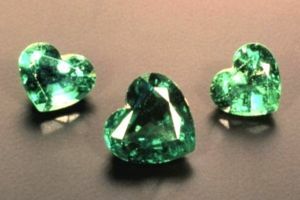 In the United States, emeralds have been found in North Carolina. Emerald is the birthstone for May. It is also the special gemstone of the Levites, one of the Twelve Tribes of Israel. This page was last modified on 11 July 2016, at 23:27.